Today I want to share Coach Jen Shaw's blog that she posted a couple days ago on lift4women.com. I think will speak to many of you that have the desire to improve your endurance running abilities but don't want to spend the majority of your time mapping routes and grinding out ridiculous mileage each week. TCS/LIFT Athlete, Jen C is the perfect example of how becoming stronger makes you faster and more durable. The TCS community was out in force on last Friday night at Austin's Zilker Relays. This is a huge event that temporarily draws the masses away from 6th street and on to the trail for one Friday night each year. This year there were nearly 1000 participants - 12 of which were TCS athletes! Each of the 4 members of each team (3 teams) had to run a 2.5ish mile leg of the relay. This may not sound like much, but when you are placed in a team environment and you're responsible for getting your job done to the best of your abilities --- aka. As Fast As Possible --- it leads to some all out work! Well, first, we love the fact that our athletes take on new challenges outside of the gym. We strive to develop our athletes in a well-rounded, "swiss army knife" way so that they can take on any challenge, at any time. Secondly, we don't necessarily train endurance as it's own special category or goal. Again, this goes back to the "swiss army knife" mentality/methodology. At TCS, our workouts focus primarily on building strength and performing high intensity tasks for relatively short durations. But, by placing these short, intense pieces back-to-back for an hour-long class.....the endurance and the ability to push through longer time domain is developed with out you even realizing it. This step away from "Long, slow" training is becoming more and more popular in the endurance community. In fact, many of the top endurance athletes are now incorporating strength and power work in to their programs. It just goes to show that having a solid foundation of strength sets you up for success.....regardless of your specific goals or sport. See ya in the gym! Some of you may heard recently that I....yes, me - "Mr. Cardio" did a Go Ruck Challenge a couple weekends ago. If you know what Go Ruck is all about, I know you're very impressed, given my admittedly neglected oxidative/aerobic system. If you haven't heard of Go Ruck.....you probably have some questions. I would first encourage you to follow this Go Ruck Challenge link to watch the video and discover what it's all about. If you know anything about me or the way I coach my athletes, you know that I value a strong mind more than a strong body. Both can be built and strengthened, but when it's all said and done - The mind dictates the body. This is exactly why I decided to do this GR Challenge with my friend and fellow coach, Nick Mounce. It was a way to test ourselves in a new way. And I gotta say, I loved every second of that grind - both the training leading up to the Challenge and the Challenge itself. Our participation in this Challenge was also a fact-finding mission. We wanted to see, first-hand, what this was all about before we unveiled RuckFit! Coach Nick Mounce, a former Marine and former Firefighter, knows what it is to train hard for a job - a mission. He's obviously had a unique perspective that will prove extremely valuable to you as your prepare for your very own Go Ruck Challenge. 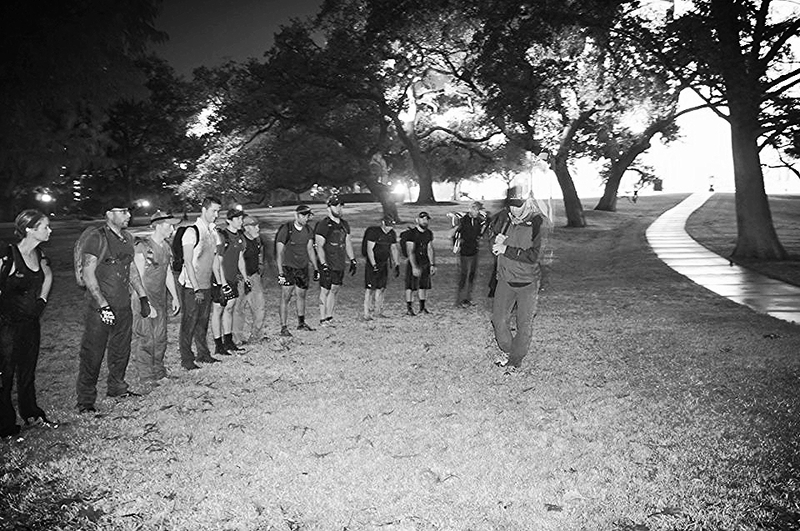 A 12 week course focused on getting athletes ready to tackle a Go Ruck challenge. Two class times will be offered on Saturday morning. Athletes can choose to attend the 630am or 10am class. Classes will last between 1.5 and 2 hours. The focus will be on strength-based endurance training. Special attention will be paid to nutrition, mobility and recovery work. Athletes will need to have a ruck or backpack capable of carrying 35-45 pounds. The class fee of $450 includes the registration fee($90) for the challenge held in Austin on April 11th. Also included is an exclusive class t-shirt and custom patch that will be designed by and produced for the athletes that take on this challenge. That's $30 per 2hr. class! Class size is limited to the first 6 people that sign up. No time to sit on the fence. Act quickly or miss this opportunity to challenge and apply your fitness. If you're looking for a Challenge to kick start 2014 we have got you covered -- RuckFit class 1A.